A new drone video has been released by China Central Television Station showing the latest progress of one of the country’s most ambitious scientific projects – a radio telescope the size of 30 football pitches. 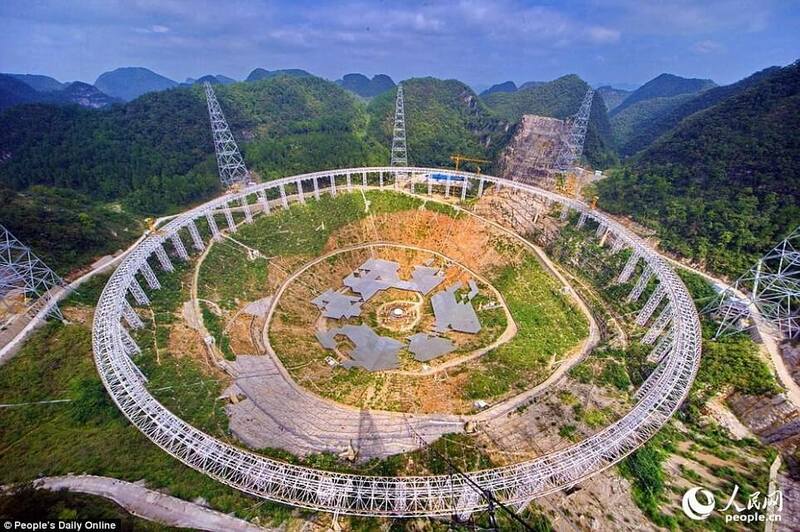 The Five hundred metre Aperture Spherical Telescope, shortened to FAST, has been billed as the world’s largest radio telescope and is located in the deepest mountains of rural southwest China. The enormous dish is on track of completion in the second half of 2016 as engineers finished the wiring installation on the telescope on October 1. FAST is located in the Dawodang depression, a huge karst valley in Pingtang County, Guizhou Province. It took the scientists as long as 17 years to find a hollow in the country large enough to accommodate the dish, which has a diameter of 1,640 feet. Construction of the £124 million (1.2 billion Yuan) project began in March 2011 and is expected to complete in September 2016. Technicians are currently assembling the telescope’s reflector, which is made up of 4,450 triangle-shaped panels. To ensure that the completed telescope can receive signals from different angles, engineers have fixed cables to the back of each panel so that it can change positions with an accuracy of 0.03 inches. It will allow scientists to get weaker radio signals from outer space, even further than our solar system. The idea of building this radio telescope was first proposed in 1993. But it was only approved in 2006 after an international review and advisory conference on the science and technology of FAST. Scientists from different fields in China, including physicists, geologists and astronomers, welcomed the construction of the new telescope as it will boost the human capacity to observe outer space. Li Di, the chief scientist of the National Astronomical Observatories Chinese Academy of Sciences, said: ‘FAST will remain the best in the world in the next twenty to thirty years after it is completed. ‘FAST can answer questions not only limited to astronomy but questions about humanity and nature. Chen Xuelei, a Chinese physicist, said that the data can help prove Einstein’s relativity theory once more statistics of gravitational waves are retrieved from the telescope. The intricate design allows scientists to shift the dish to receive radio signals from different angles. Li Di said: ‘The biggest challenge of this project is to calculate quickly and attached these data to thousands of computers to change the direction of such a gigantic telescope. The natural landscape of Dawodang depression provides the perfect size and shape for the construction of the telescope. The ground also provides enough support for the gigantic telescope. The porous soil forms an underground drainage system that protects the telescope. With only one town in the 12 miles radius, the Dawodang depression is extremely isolated from magnetic disruptions. The remoteness of the location also protects the surrounding landscape from any damage.